When your baby is first learning to walk, there are can be tumbles, tears, and even boo-boos. UpSpring’s Walking Wings learning to walk assistant helps your baby balance naturally with his hands free. He’ll take fewer tumbles, which will help to build his confidence (and yours, too!) as he takes those first steps. Why UpSpring Walking Wings Baby Walker? When is it appropriate to begin using Walking Wings with my baby? Walking Wings is recommended during the two stages that progress as baby starts to balance and becomes more stable on his feet. How do I know if the Walking Wings vest will fit my child? The Walking Wings vest fits a chest circumference of 19 – 26” (48-66 cm). Do not use if child’s chest circumference isles than 19” or more than 26”. How do I use Walking Wings? What is the fabric content of Walking Wings? It’s 100% cotton, and is machine washable and dryer safe. The Walking Wings vest fits a chest circumference of 19 – 26” (48-66 cm). Do not use if child’s chest circumference is less than 19” or more than 26”. Your baby should be doing three things in order to use Walking Wings. She should have good balance, she should be able to bear weight unassisted, and she should be clearly interested in trying to walk. Walking Wings snap on easily and you and your baby are good to go. 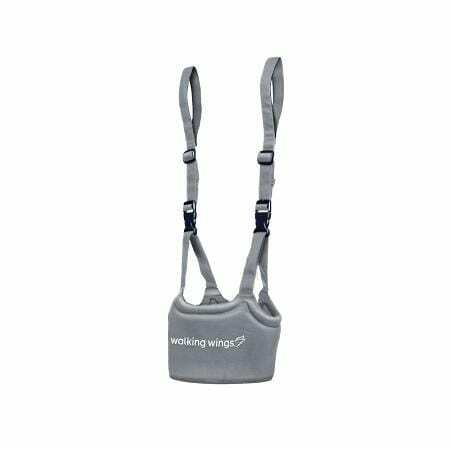 Fasten the safety buckle on the back of the Walking Wings vest and tighten the strap as snugly as possible for proper support. The vest should fit tightly so it does not easily ride up on your child. (Plus, if it rides up it will ruin the look of her cute outfit.) Always use the safety buckle – never depend on the hook and loop only to support your child. After fastening the vest, hold the handle straps securely while allowing your child to balance and confidently practice walking. (It’s a confidence exercise for you, too, mom. We know you’ll do just fine.) Letting babies be hands-free, as Walking Wings does, helps improve their balance and stability. Parents should always hold the handles with two hands. Before your baby can walk, she needs to have good balance and be able to bear her own weight, unassisted. She’ll need lots of practice – about 1,000 hours before she is a skilled walker. Reaching down to hold your child’s hand as she learns to walk can do you an injury, too. All that hunching over can lead to an aching back! 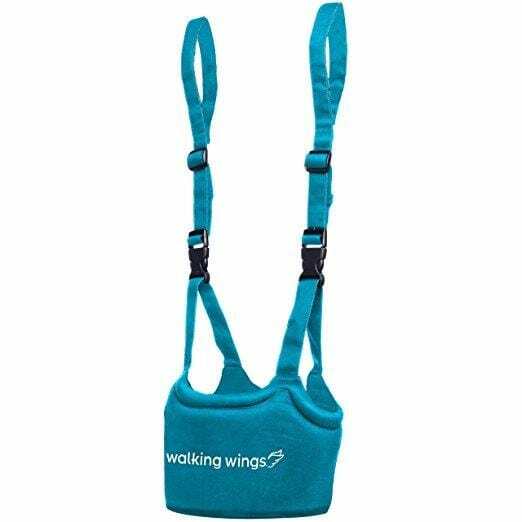 Walking Wings supports your child while keeping her arms and hands free. This means she uses them naturally for balance as she walks. It also means you can stand up naturally and still help her to walk. Win-win for your little walker and her walking buddy (that’s you, mom). How will I know when my baby is ready to walk? We've put together some signs and clues that your baby is ready to walk. Click here to learn more.